Cape Town, a canvas of amalgamated cultures, ethnicities, and religions, has over the years experienced many significant changes. With the commercialization of many regions of South Africa, Cape Town has transformed itself into a contemporary city. These changes are evident in the ever popular ‘wedding season’ which takes place across Cape Town during the summer season. Weddings, specifically within the Muslim community, have adopted a much more ‘organized’ appeal. In previous times, guests knew what to expect; the food was pre-packaged; with meals consisting of chicken, salad – and, if you are lucky, a roll – a cool drink and an ice cream. The tables of guest were also traditionally served Konfyt and snacks. Today, wedding guests are served five-course meals, with every aspect of the reception venue decorated. Within the Muslim community of Cape Town, couples are more readily usurping western culture. Where previously entire families assisted in the planning and execution of wedding ceremonies, today, it is found that the immediate family residing within the wedding home are the family members who provide assistance. These days, for the wealthy elite, there is also a wedding planner or wedding stylist. Allie feels that the cost of hosting a wedding reception has increased drastically. The expenses required to host weddings ceremonies, ranging from between R25,000 to R250,000, are so high that many may say could be used instead to purchase a home. Haniyah Davids, for example, started her own “wedding fund”, choosing to diminish the burden on her parents. The character of modern-day weddings Allie describes as ‘very stiff’. In contrast, weddings that occurred 30 years ago witnessed the vibrant singing of the cape-Malay Hollandse Liedjies (Dutch songs). Numerous parents described the cost of modern-day weddings as ‘too’ exorbitant, deeming the reception an ‘unnecessary addition’ to wedding celebrations. Instead, they feel that the nikaah (Islamic wedding ceremony) is “all that is required” – perhaps accompanied with cake and tea for the immediate family. Allie further asserted the importance of the nikaah as the main ceremony of the day. Allie beseeches couples to learn about marriage; specifically the Islamic aspect of marriage. Also stating that couples should never neglect learning about the deen (religion of islam), an aspect of marriage she regards as ‘vital’ to the overall success of a marriage. As catered weddings are on the increase, the culture of the ‘huisbruid’ appears to be a thing of the past. (Zawaj.com Editor’s note: I don’t know what a “huisbruid” is. I tried to look it up but couldn’t find anything. Does anyone know?). Yasmina Jones Sawant, owner of Mina Moo and Baby, who is married for 11 years, met her husband whilst living abroad in London. The two decided to travel to South Africa and make nikaah. Not wanting to impose an unnecessary financial burden on their parents, the couple opted to host a ‘huisbruid’. Sawant is of the opinion that the choice to host a big ceremony is a personal one. Whilst she prefers to have hosted an intimate ceremony, others may feel more inclined to host a glamorous wedding “with all the frills”. Sawant recalls that previously family members “would be running around, washing up dishes, and serving wedding guests.” This makes them feel that they are part of something. Today it could be said that the culture of weddings, with all the “extra trimmings”, appears to distract from the marriage itself – the most important contract that married couples enter into. “They forget why they are actually getting married and how they are going to spend the rest of their life together,” says Sawant. Weddings today provide both the family and the wedding couple with a leisurely experience. This has, however, removed from the experience the time spent bonding with family members in the planning stages of the wedding. An all important aspect of weddings is the ‘photo-shoot’, which could be described as a staple of weddings since the advent of photography. The owner of A&R Photography, Abubaker Abdullah, explains that Cape Town couples no longer wish to be photographed in Cape Town and Claremont gardens. Couples, instead, prefer more ‘alternate’ venues such as vineyards and farms. 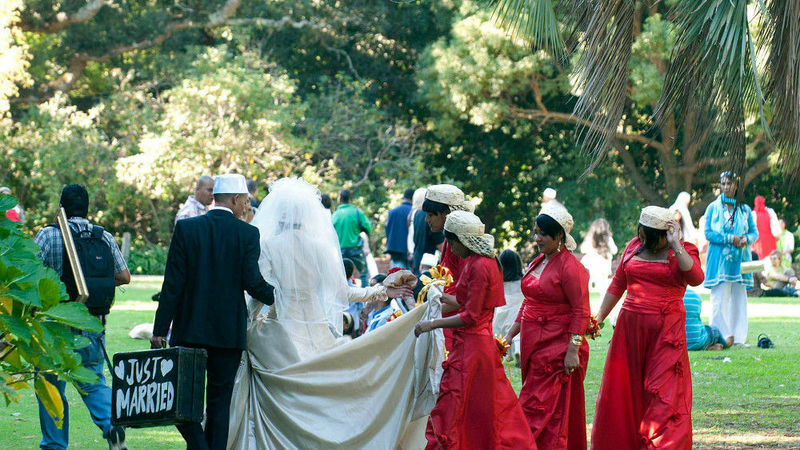 Muslim wedding party visits Claremont Gardens in Capetown, South Africa, for a wedding shoot. Photography in general has altered the capturing of weddings; where previously couples captured one staged moment, couples today choose between hundreds of photos to be placed in a coffee-table book. With the advancement in technology, weddings are captured, moment by moment, from the Nikah to the ‘bruidskamer’. Couples are, therefore, through the video-graphical lens, able to appreciate and absorb their special day. Abdullah explained, that as a staple of wedding ceremonies, photographers charge various prices, ranging between R4 000 to R15 000 – depending on the number of photographers that the couple wishes to employ. Whilst, videography services range between R10 000 to R15 000, depending on the couples preference of having both angles captured – yes, ‘both angles’! As service providers, photographers are responsible for capturing what can only be described as a couple’s ‘most important day’. Well known Cape Town aalim, Shaykh Abdurahman Alexander, explained that when the bridal couple marries, according to the shariah (Islamic law); it is Sunnah to host a walima. A walima refers to the celebration of the marriage and a celebration of the bridal couple. The walima, according to Islam, is hosted after consummation has taken place. Within the Western Cape, however, it is common practice for a reception to be hosted after the nikah on the day of the wedding, prior to consummation of the marriage. The preferred rule according to scholars, however, is to host a feast after consummation has taken place since consummation indeed calls for a celebration. An important purpose of the walima is the ‘publicizing’ of the marriage. Shaykh Alexander further notes that the religion of Islam discourages individuals from placing themselves in financial difficulty when hosting a wedding reception or walima. Importantly, Islam encourages individuals not to restrict the invitation list to the rich and elite within the community, but rather extend the invitation to the poor as well. The Prophet Muhammad [May peace and blessing be upon Him] mentioned that one must not be wasteful and exorbitant about it; everyone can spend according to their means. The dress requirement, specifically the dress code of the female, is the covering of the entire body, with the exception of the hands and face. It is however permissible that the bride adorns herself whilst preserving her modesty. The guests of the couple – males and females – are expected to dress modestly according to the requirements of the shariah. With regard to the separation of genders at the ceremony, Shaykh Alexander, asserts that the religion of Islam prescribes that no unnecessary intermingling between the two genders take place. In certain areas of South Africa wedding ceremonies separate the genders with the use of a curtain. There is, however, “no hard-and-fast rule for this” within the Qur’an and Sunnah. Certain individuals do, however, argue that the guests invited to a wedding are generally close relatives and therefore do not require the ‘parda’; the Shaykh however echoes the sentiments of the shariah which implores that no unnecessary intermingling should occur. In modern times it is becoming prevalent for Muslim couples to adopt Hindu and western culture. The Shaykh asserts that if customs contradict the teachings of Islam and directly violate the Shariah, then these customs should be banned. Islam, however, embraces customs that results in the bonding of family ties. With the regard to the dawer, mahr, or the more commonly understood term, ‘maskavi’, the Shaykh explained that it is the first gift that the husband gives to his wife, and should not be considered the ‘purchase’ of a wife. The mahr is mentioned in the Qur’an, where Allah says (which may mean): “And give the women their dowries with a good heart” [Qur’an 4:4]. This is the prerogative of the bride. It is, however, advised that brides not make unreasonable requests. Brides should therefore request the mahr according to the income of her groom. It is narrated by Sahl bin Sad As-Sa’idi that one of the ashaab (companions) came to the Prophet Muhammad [May peace and blessing be upon Him] and said that he does not have anything to provide to his bride as mahr. The Prophet Muhammad [May peace and blessing be upon Him] asked him if he owns anything, he replied that he owned a small iron ring, which the Prophet Muhammad [May peace and blessing be upon Him] stated should be given as the mahr. The Shaykh, who has been performing nikaah’s since 1985, explained that the mahr can therefore be anything of value, in the form of money, property, or in the form of a university degree. The Shaykh further noted that in a ceremony, over which he presided, the bride requested that the groom teach her the Qur’an as her mahr. The most popular request in Cape Town is the Kruger Rand or silver coins, with requests ranging from R5,000. The bride may grant the groom a gift, if she so wishes, which can only strengthen their bond. Shaykh Alexander stressed the importance of the duty of parents, and implored them to encourage their children who have reached marital age to attend premarital classes. The Shaykh attributes the current divorce rate to the influx of romanticized expectations of weddings and marriage produced in television programmes. He explains that individuals in the modern era are conditioned to absorb ideas from television. Couples, instead, should take heed of the marriages of The Prophet Muhammad [May peace and blessing be upon Him] and understand its lessons. The problem with Muslim weddings today – and three crazy ideas for fixing it!